5793 labyrinths found. Showing 5601-5620. Sorted by country, state, city, then zip/postal code. I am available for workshops and I will, under certain circumstances, loan my labyrinth out. Please call me for further information. 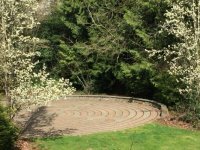 Beautiful outdoor labyrinth is in a grove of trees just to the west of the church parking lot. Look for sign marking the paved path down to the labyrinth. 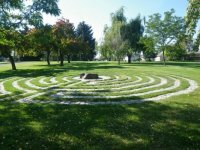 The Healing Garden in which the Labyrinth resides is open during daylight hours. This photo was taken just as the final touches were put on the original masking tape labyrinth. It has since been painted onto the floor. 46.09 N° Lat. ; 118.27 W° Long. Access by entering alley on north side of church off of Palouse Street. This takes you to our main parking lot. The labyrinth is located in the overflow parking lot across Marcus Street. The perimeter of the Quinn Mountain labyrinth as well as the center and the paths in and out are covered with red hemlock bark shavings in contrast to the earthen color of the pea gravel/pebble covered circuits. The paths and center form a keyhole design. Visitors by appointment only, please. We encourage you to call to schedule a visit and to get directions. EcoPlace has a number of quiet meditation spaces, and two retreat suites for visitors wishing to stay overnight. Call to inquire about availability and rates. 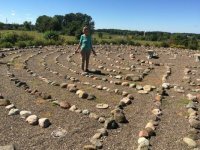 Please contact J. Christina Brittain, PhD, ecopsychologist and resident founder of EcoPlace at Quinn Mountain for information about scheduling a visit to tour the grounds, garden, and to walk the labyrinth. Similar to Classical design except that the entry and exit are open. One has the option of walking into the center in a clockwise or counterclockwise direction, and then reversing direction on the way out. Design reference: The Complete Guide to Labyrinths by Cassandra Eason, Pg. 99-101. 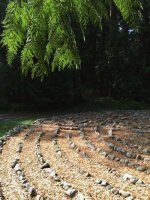 This labyrinth does "obey the 'rule' that a labyrinth should draw you into the center...and then take you away again." 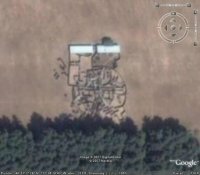 N 45.57262 ° Lat. ; W -122.19509° Long. 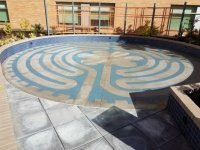 Labyrinth is located on the east side of our main sanctuary. The adjacent street is Elliot Ave. North. Chartres design, with a nice bench in the center to meditate or rest, etc. The Allied Arts Center is located at Gilbert Park. Look for the flat rock at its center on the embankment near the parking lot. Santa Rosa Labyrinth, design by Lea Goode-Harris, construction by The Laughing Flower Labyrinth & Landscape Co.
Myra Ryneheart, The Laughing Flower Labyrinth & Landscape Co.
A evolving and continually remodelled free-form labyrinth designed to test, evolve and initiate students of a school, assisting in developing inner focus and other mental abilities. Go south out of Amery, WI. Look carefully for a white sign with the churches name. Go 1 mile west. The labyrinth is behind the church.